Whereas I just poke around the fringes of syncro repair, Ed In Vancouver goes deep with rust repair and a Ford Zetec engine swap. His website is here. I have the cabinets out of my ’82 westy and while moving the sink/stove top I carelessly broke off the hose barb that connects the sink drain hose. I had replaced that part years ago after i broke it the first time, this time I decided I didn’t need a p-trap on the sink. Why do you need a p-trap there, eh? I took the trap assembly off (4 screws and a gasket) and I connected the drain hose directly to the sink drain “spout”. That spout is still made of the suspect brittle plastic but try as I might, I could not unscrew the plastic from the stainless sink. Heating the drain hose, which by the way is 28 inches long, with a heat gun allowed me to get the hose over that spout, and secure with spring type hose clamp. Its not a barbed spout, but the hose is on there pretty darn tight. All my talk about rubber mounts reminded me of this neat home made solution to steering rack movement. I had this posted on my web site, thought I ‘d put a copy here too. 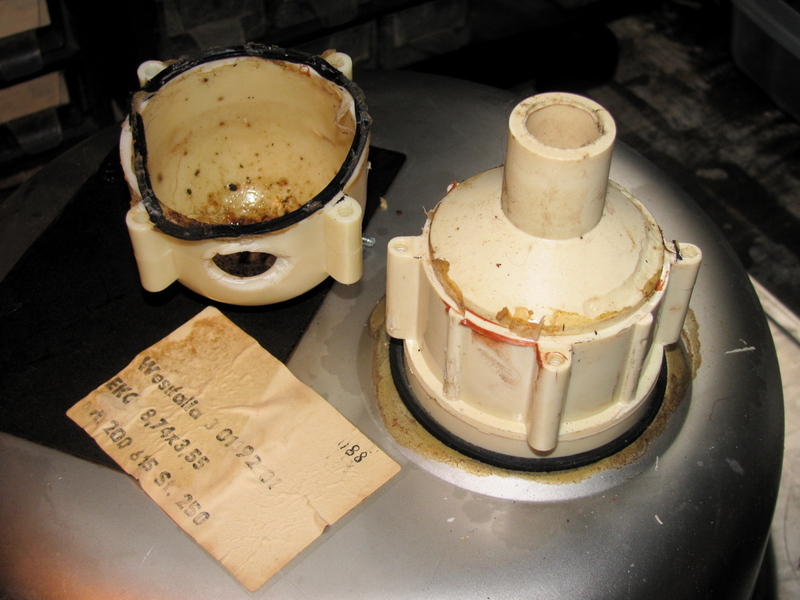 Gary Stearns’ method of how to make your own polyurethane bushing to replace the slopy or worn out stock units. “Attached is a bitmap of drawings that I made of these bushings and their installation. The one’s that I started with came from Autozone and were sold as anti-roll bar bushings in a pack of eight. Update: Well I got wrong info, there never was a spacer on front mount. In fact the tabs on the plastic spacer will not fit into mounting hole on the front mount. I recently posted how I looked at the front diff. mounts and discovered that the foremost one had slightly distorted rubber mounts. What I did not realise was that some syncros have plastic spacers on those mounts too. Mine did not. A quick survey on the syncro and the vanagon mailing lists only returned one other owner (also an ’86 van) that did not have those spacers installed in the front mount. 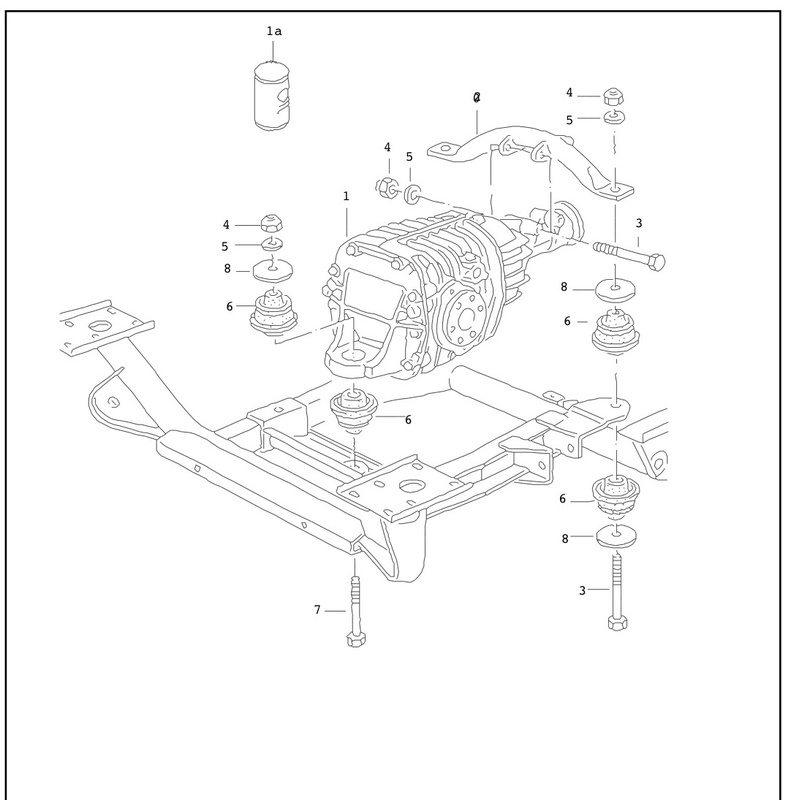 The parts catalogue shows none of the front diff. mounts having spacers, but do list them on the side, and 4 needed (4 would be enough for only the 2 rearmost mounts) You can see at least the rearmost ones with spacers in the Bentley manual. 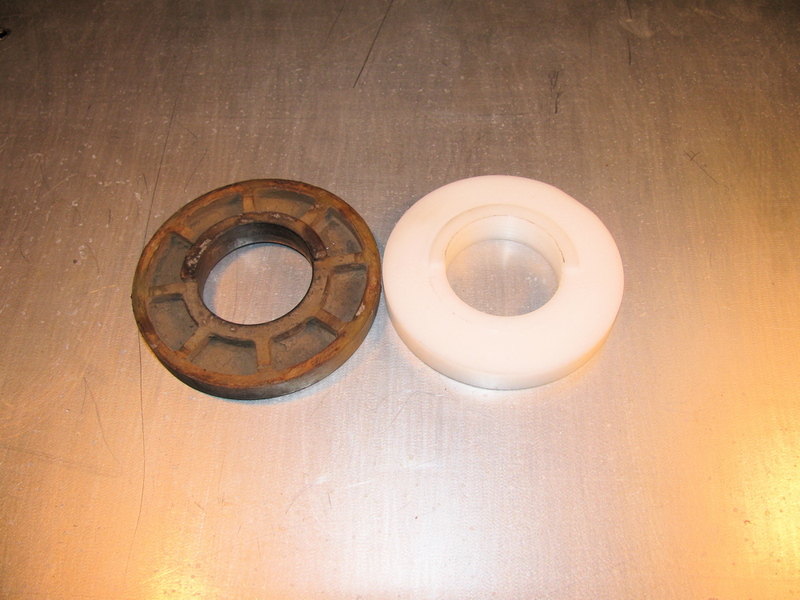 The part number is 251 199 399 , its the same plastic spacer that is found the transmission mount. I decided to try and make a spacer(s) and found a scrap of polyethylene cutting board that was big enough to make a reasonable copy. I just need to make another then install and see what difference it makes in the front diff. flange angle saga. 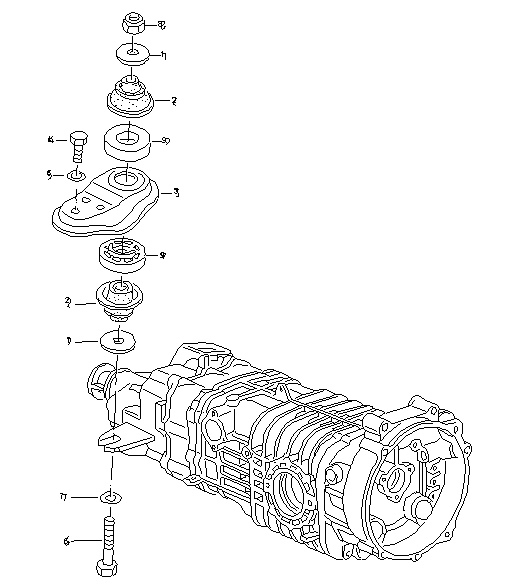 And here is a diagram of the front diff. mount arrangement, note absence of spacer in all 3 mounts. If there is anyone out there interested enough to have a look at their own syncro front diff front mount and report back presence or absence of spacer, I’d be very grateful. Laser on transmission – dot 103 mm below centre of front diff. flange. This works out to be a 4.6 degree angle on the trans. flange. Laser on front diff. – dot 83 mm below trans. flange. This works out to be a 3.7 degree angle on the front diff. flange. The numbers are close to what I measured before, but I feel confident in these measurements. In the pictures the laser dot size seems larger than real life, and in one shot you can see the laser beam itself. The CCD in the camera must be sensitive to the wavelength of the laser. Note: picture showing measuring stick on front flange and dot around the #8 mark is actually showing an erroneous first try, I had a bit of “schmumf” stuck between laser and flange, second try had dot further down measuring stick, and that is shown in close up pic. Not being happy with how the laser pointer was held in the jig, I finally did what I should have done all along and that is use the laser’s own mounting bracket. The bit of aluminium angle bolted to the round jig gets clamped by the red bracket’s captured screws (not visible in pic). Now I can adjust the beam so that it is pretty well aligned with centre of jig. 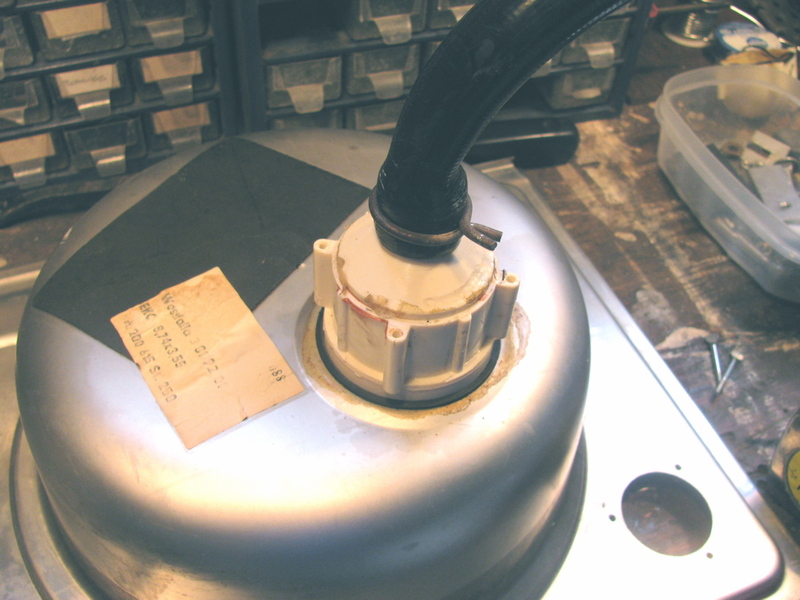 Previously the best I could do was a 1 cm circle, over the 1.285 m between flanges, when jig rotated on flange. 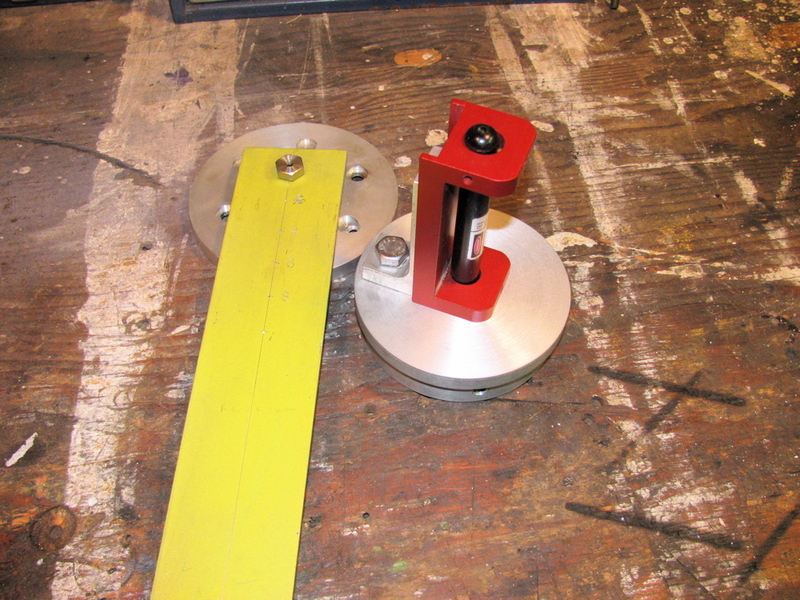 The thing on the left is the crude reference jig that sticks onto the the flange opposite and shows the laser dot.